Turn right, then turn left. This is the entrance for cars to Campus Schoonmeersen. 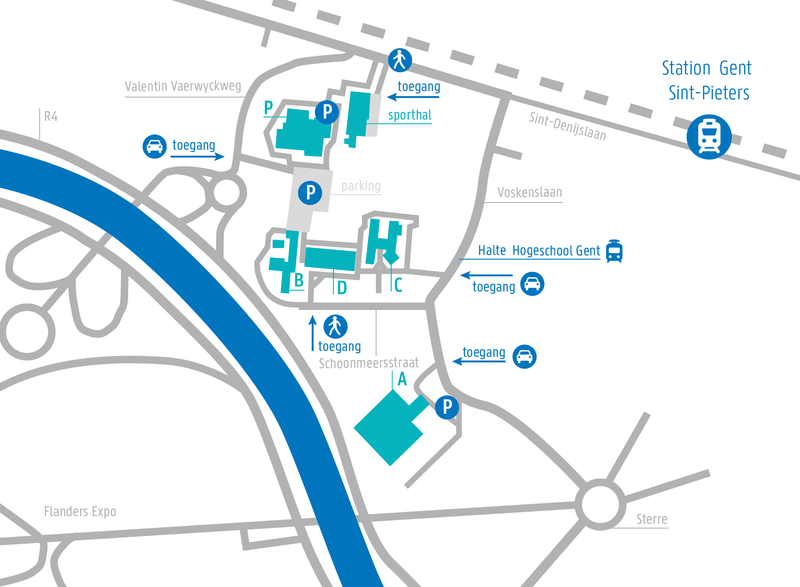 On the campus map, you can find the location of the campus buildings. Take the "airport city express" train to Brussels Midi (Brussel-Zuid). Switch to a train to Ghent: all trains with destination Oostende, Knokke-Blankenberge and Gent. The Inter City train takes you to Ghent in about 40 minutes. Walking from the station to the campus takes about 5 minutes. Take the station exit Voskenslaan. Follow Voskenslaan until you see the campus on your right.